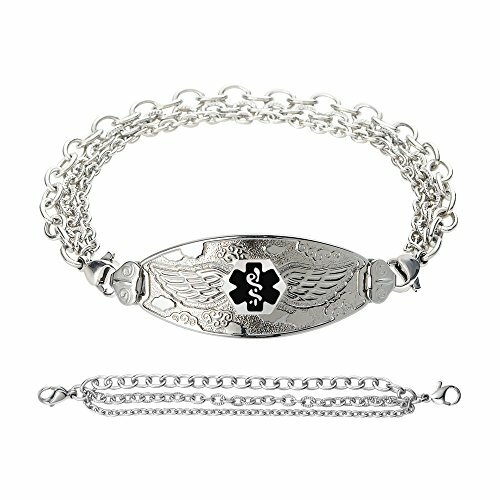 Divoti Angel Wing medical alert bracelet is artistically decorated with a pair of beautiful angel wings (God covers & protects), comes with a Tri-Strand stainless chain and bears a black color hard enamel filled medical caduceus symbol on the front that is internationally recognized by first responders, alerting them to your personal medical information engraved on the back. Custom engraved in high contrast black laser engraving to personalize your medical message (on back: 4 lines of 18 characters, spaces included) + NEW ANTI-FADING PROCESSED ADDED: CITRIC ACID PASSIVATION (see photo)! If you have any questions about this product by Divoti, contact us by completing and submitting the form below. If you are looking for a specif part number, please include it with your message.